Virginia Estates has over 15 years expertise in finding you the perfect home in Charlottesville. Our central Virginia realtors have access to local Charlottesville MLS listings and offer a comprehensive array of services for the Charlottesville real estate market. Located in Albemarle County, at the foothills of the Blue Ridge Mountains, the city of Charlottesville is one of the best locations in the country to buy a home. The Charlottesville area has around 118,000 residents, is home to the University of Virginia, and boasts an diverse economy with very low unemployment rates. In 2004, Cities Ranked and Rated place Charlottesville at the top of their list as as the “Best City to Live in USA & Canada”! With it’s abundance of restaurants, festivals, wineries and historical sites many consider Charlottesville to be Virginia’s cultural center. Proximity to National Forests and Parks, as well as dozens of local trails, gives Charlottesville residents easy access to a number of recreational activities such as hiking, camping and bicycling. Buyers will find that Charlottesville Homes for sale vary greatly both in price and style of architecture; local houses represent a great variety of architectural styles, including georgian, federalist style, antebellum, colonial, and modern new “Green” construction. A number of Charlottesville neighborhoods place a great emphasis upon aesthetics, resulting in beautiful tree-lined streets inside the city and in the nearby communities. Surrounding Albemarle County there are many vineyards, horse farms and farms that give a bucolic appeal to the beautiful rolling countryside. 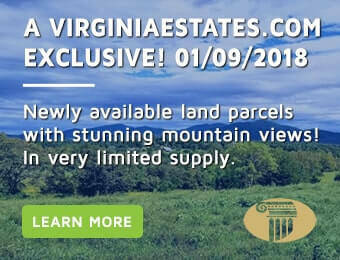 If you are thinking about purchasing a home in Charlottesville or any other type of Charlottesville real estate, Virginia Estates will help guide you through the process. From finding the perfect property to negotiation and closing, our expert local Charlottesville Realtors are here to meet your specific needs and represent your interests. Charlottesville is the home of presidents Thomas Jefferson, James Madison and James Monroe. Thomas Jefferson has an enduring legacy in Charlottesville, including The University of Virginia, which he founded in 1825, and Monticello, his mountain-top home and a UNESCO World Heritage Site. The Virginia assembly first designated Charlottesville as an official, independent city in 1762. Fourty years later, a courthouse was built to serve the residents of Albemarle and surrounding counties, and portions of the courthouse still stand today. Around 1777 the city’s residents began laying concrete to support horse-drawn carriages, and by 1820 Charlottesville had an impressive two miles of paved road. With the end of World War Two, the city went through a great period of growth and prosperity and has been growing every since. In the 1970s the Charlottesville decided to banned car traffic along a 1/2 mile section of Main Street thus creating the famous Downtown Mall, a brick-lined pedestrian area where many people gather to shop, dine or just hang out in on of the many cafes. Monticello, the home and plantation estate of America’s third president Thomas Jefferson, is located on winding Route 53, approximately two miles southeast of Charlottesville. Monticello is a National Historic Landmark as well as a UNESCO World Heritage Site and sees about a half million tourists per year. The Rotunda at the University of Virginia was designed by Thomas Jefferson and was intended to be the intellectual and academic heart of the area. Initial construction began in 1822, the university restored it to match Jefferson’s original design in 1975. Walking tours are offered to the public. The John Paul Jones Arena, at 16,000-seats, is the largest indoor arena in the Virginia, an offers an impressive schedule of college basketball, world-famous entertainment acts, and some of the biggest performers in music and stage. Charlottesville also is within a half-hour to the George Washington National Forest, the Shenandoah National Park and the Blue Ridge Parkway. The Appalachian Trail offers a myriad hiking and camping opportunities as well as spectacular mountain scenery and breath-taking views.